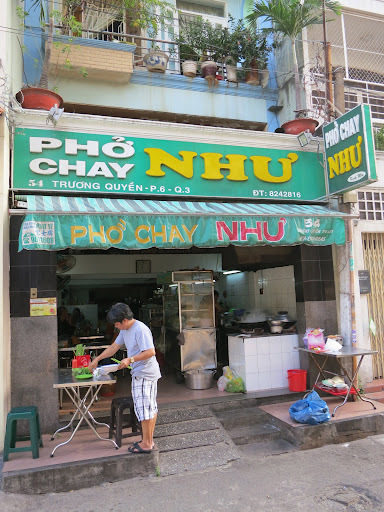 Pho Chay Nhu is located in a small alley running parallel to Hai Bai Trung street and the nice Cong Vien Le Van Tam park. When we got there for our January 1st breakfast, a mini-van full of monks took seat in the back of the restaurant and we figured out that was a sceal of excellence: good enough for monks, good enough for a fat foreigner. 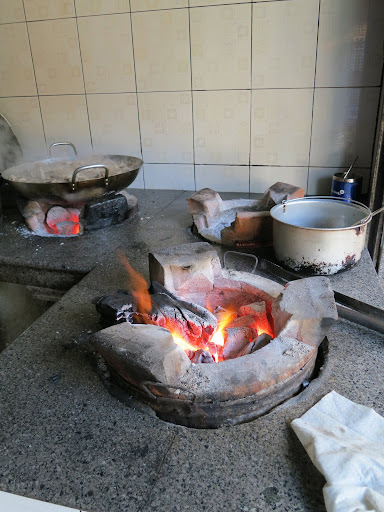 The restaurant is tiny and the open kitchen uses charcoal fire, very rustic but not uncommon in Vietnam. The cooks were super busy and we started with some vegan samosas. These were simple but tasty. Food is often offered on the table at pho places and I ended up eating the whole plate. We decided to order the pho chay. The pho chay or vegan pho was an amazing exemple of what meatless cooking can be. If you have doubts about how good vegan food is, well, I encourage you to try Vietnamese vegetarian cooking. The mushrooms were great fake beef. The rolled tofu skins reminded me of the good yuba I had in Kyoto. The broth tasted very good, the richness and boldness of the flavor was equal to the best beef or chicken broth I had in Vietnam. I spooned the last drop of soup and felt happy to start 2013 with such an healthy meal. Pho Chay Nhu had some other great looking dishes, but it will be for our next trip. 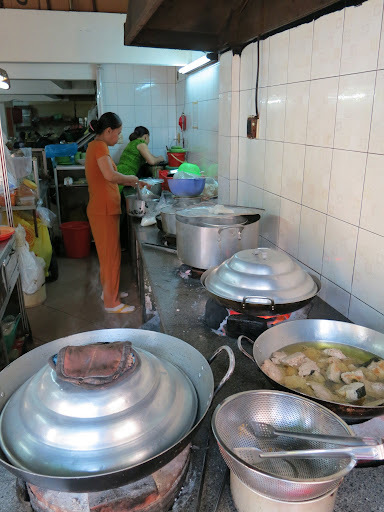 If you have a favorite vegetarian restaurant in Vietnam, don’t hesitate to leave a comment.